My new favorite site, Autoblog, has pointed out a fabulous article on learning to drive the Nordschleife. Project Gotham Racing fans, start saving for airfare to Frankfurt. The Nordschliefe vies with Belgium's Spa for the distinction of being one of the most famous and unforgiving road courses in the world. In 13 miles (!) it has over 100 corners (!! ), and elevation changes that are more suited to an air show than a road race. I've only ever driven it in simulation, but even that has been enough to induce gut-wrenching fear. On the down side, Autoblog is a frustrating my fantasies of obtaining a Lancer Evolution. 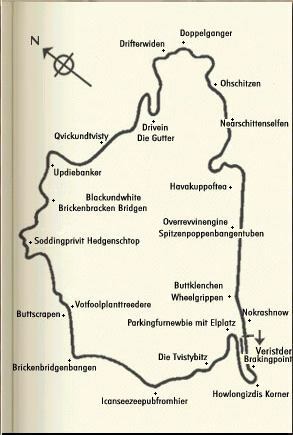 So I guess if I ever do take a lap around the Nordschliefe, it won't be in a LanEvo. If only I could convince Nissan to sell a street-legal version of the Skyline here. I too dream of the Nordschleife. I have no definate plans to go yet, but I know what I'll do when I get there: http://www.75experience.nl/index_eng.html It would be so cool to take a track prep'd version of my own car around the 'ring. Shame the $ tanked compared to the Euro. PS: You are spot on in your F1 posts. The Feb 26th post was particularly prescient. Just looked at the comments, and lo and behold, I find my friend Faisal Jawdat.